Spectrum/The town of New Milford honored veterans at a special ceremony on Veterans Day, Nov. 11, 2018. An armistice, or temporary cessation of hostilities, was declared between the Allied nations and Germany on the 11th hour of the 11th day of the 11th month of 1918, ending World War I. The Roger Sherman Chapter, National Society Daughters of the American Revolution, held a veterans breakfast at the VFW Hall on Avery Road. During the breakfast, a New Milford Vietnam medal was awarded to a veteran and several Quilts of Valor were presented. After the breakfast, a ceremony was held on the south end of the Village Green. 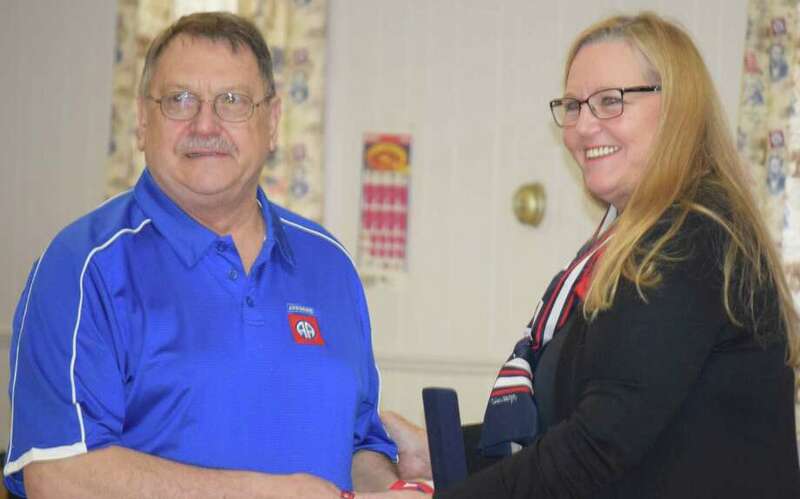 Above, Pat Peet of New Milford receives the New Milford Vietnam Medal, on behalf of his brother, Richard A. Peet, a former New Milford resident who now resides in Washington, from Jennie Rehnberg, vice regent of the Roger Sherman Chapter, DAR. The town of New Milford honored veterans this past Sunday, on the 100th anniversary of the Armistice, or temporary cessation of hostilities, declared between the Allied nations and Germany on the 11th hour of the 11th day of the 11th month of 1918, ending World War I. To kick off the day, the Roger Sherman Chapter, National Society Daughters of the American Revolution, held a veterans breakfast at the VFW Hall on Avery Road. During the breakfast, a New Milford Vietnam medal was awarded to veteran Richard A. Peet, which was accepted by Richard’s brother, Pat Peet, and several Quilts of Valor were presented. After the breakfast, a ceremony was held on the south end of the Village Green. For more photographs, see www.newmilfordspectrum.com.